The Wake Watcher boat mooring system protects your boat from wakes, waves and winds. Avoid the clutter and complexity of other mooring systems with this simple to use boat mooring system. 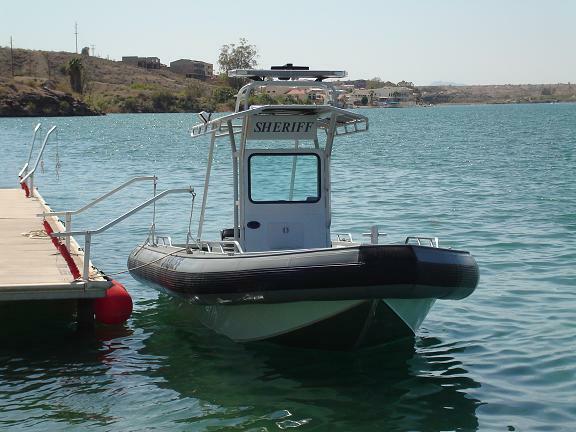 The Wake Watcher boat mooring system allows your boat to move up and down resisting vertical, horizontal and lateral movement while positioning your boat at a safe distance from the dock. For boats up to 3500 lbs. Boat held at a safe distance from the dock. To board, simply pull in one of the Wake Watcher arms. Release the arms and the Wake Watcher mooring system will automatically reposition your boat away from the dock. Start your motor, unhook the two Wake Watcher ropes from your boat - the arms will automatically retract - and cruise away. 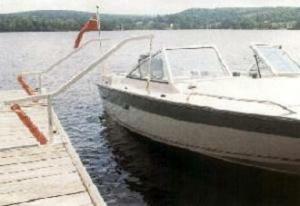 When docking, pull up close to the Wake Watcher arms, hook the two ropes to your boat, dock and release the arms. The Wake Watcher mooring system will automatically reposition the boat at a safe distance from the dock.